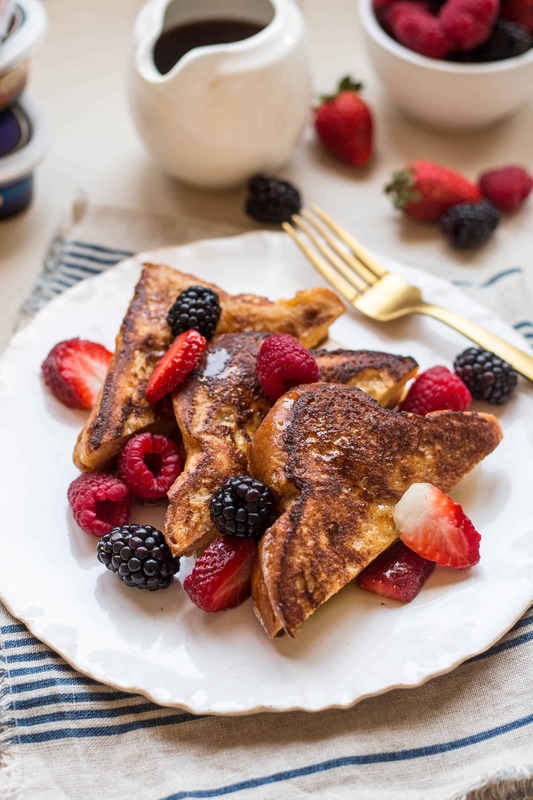 This easy recipe for Stuffed French Toast with Berries is a rich and decadent breakfast perfect for the holidays! The best stuffed French toast recipe ever! Are you ready? Presents wrapped? Cookies baked? Mistletoe hung? I am nowhere near what I would consider to be “ready” for Christmas, but I know I’ll somehow manage to get there in time. It’s like this every year – a mad dash to the finish line. But that’s all part of the excitement! Christmas morning breakfast is major. Do you know what you’ll be serving yet? Growing up, my mom always popped open a can of cinnamon rolls, which was everything a kid could want after an exhausting morning of opening up presents. This year, we’ll be heading up to Grandma and Grandpa Graff’s house for Christmas brunch. The Graff’s do Christmas right – I consider them professionals, and I always look forward to spending the day at their home. But this year, I’m especially excited that we get to enjoy their famous Christmas brunch. The Graff’s put out the most amazing breakfast spread, and the past few years we’ve had to miss it. They have coffee, mimosas and bloody Maries, plus French toast, bacon, fresh fruit and – get this – eggs Benedict made to order with perfectly poached eggs and buttery homemade hollandaise. Jealous? You should be. A lot of work goes into that brunch and I’m so grateful that I get to just sit back and enjoy it. But an extra special Christmas breakfast doesn’t have to be difficult or time consuming, and this stuffed French toast is proof. It’s made especially easy thanks to Finlandia‘s new line of Creamy Gourmet Cheeses. They come in a variety of flavors – Classic (plain), Black Garlic, Garden Dill, Sweet Lemon and Vanilla Bean. The Vanilla Bean Creamy Gourmet Cheese is lightly sweetened and packed with gorgeous vanilla flavor. It tastes a bit like cheesecake and makes the most amazing filling for this stuffed French toast. I sandwich a generous dollop of Vanilla Bean Creamy Gourmet Cheese between two thick slices of buttery brioche bread, then take it for a dip in a rich custard bath. Once thoroughly soaked, it gets sautéd in salted Finlandia butter until it’s nice and crisp on the outside and perfectly tender inside. This French toast is pretty perfect on it’s own thanks to the perfectly flavored Creamy Gourmet Cheese, but the holidays call for a little something more. Serve it up with pure maple syrup (warm it up first for best results) and some mixed fresh berries to make your Christmas morning extra special, extra delicious – and most importantly – extra easy. Look for Finlandia‘s new Creamy Gourmet Cheeses with the other gourmet cheeses in the deli section of your grocery store. See the product locator for more information. Thank you to Finlandia for sponsoring this post! All opinions are 100% my own. Make the filling: Use an electric mixer to beat together the softened cream cheese, maple syrup and vanilla extract until smooth. In a large bowl, whisk together the eggs, half and half, cinnamon and vanilla, then set aside. Spread 2 tablespoons (eyeball it) of filling OR Finlandia Creamy Vanilla Bean Gourmet Cheese on a slice of bread, leaving roughly a 1/2 inch border around the edges. Top with another piece of bread and gently press to secure. Repeat with the remaining bread and filling. Melt 1 tablespoon salted Finlandia butter in a large skillet over medium-low heat. Dip one sandwiched piece of bread into the custard, turning a few times to thoroughly coat, then transfer to the hot pan. Repeat with one more. Cook for about 4-5 minutes, then flip and cook for an additional 4-5 minutes on the other side. Be sure to keep the heat at a relatively low temperature to avoid burning. Melt more butter in the pan and repeat with the remaining pieces. 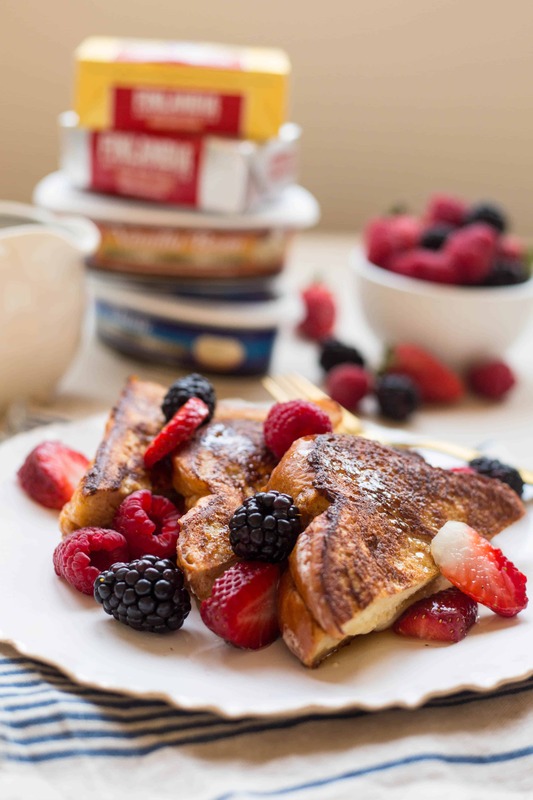 Cooked french toast can be held in a 250 degree oven for up to 1 hour before serving. Slice each piece of french toast in half on a diagonal, then place 3 halves on each plate. Serve with mixed berries and maple syrup. There is no way that I am even close to being ready for the holidays. But I’ll tell you what. . .if you serve this amazing french toast, I guarantee that no one will notice that the mistletoe isn’t hung or the presents aren’t wrapped to perfection. What a divine way to kick off the festivities. Will have to make these on New Year’s Day! It’s latkes, bagels, and lox on Christmas morning for us. I’ve been trying to find Finlandia’s cheeses at our local Shoprite and haven’t found them yet… They have the butter… as a matter of fact, I had 5 bricks of the Finlandia butter in my cart yesterday and the lovely woman behind me at checkout (who was kind enough to let me go ahead of her) was checking out the few items I had and mentioned how wonderful Finlandia’s butter is! I wasn’t expecting that… she said she wanted to come to my house for the holidays… hehehe! I’ll ask at the courtesy desk next time about where I can find the cheeses from Finlandia. I really wanted to make my tiramisu with that… next year, I guess.